The park is a lightly developed fairly open natural resource area. Currently Fishing is the main amenity. We have partnered with the IDNR to create the public access site. The access site has a concrete ramp for boat drop off and ample parking. Lake is a nine acre lake. Aquatic species are surveyed and stocked by the IDNR, if needed. Park is 127 acres with some older stands of timber and a much newer growth section. Park has one open shelter. Shelter is used first come first serve. The three mile trail will see some attention in 2018. We will be re-routing the north section to be less management intensive. Trails will be marked if time allows. Playgrounds are currently present, as is a basketball court, sand volleyball, and baseball/softball field. A new playground complex was added in 2018. 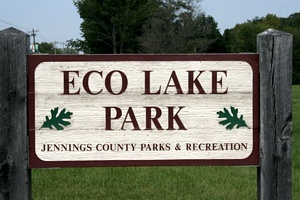 Eco Lake Park upgrades are currently absorbed by a JCPR budget that has had no increases relative to the additional facility. All major upgrades are grant dependent at this point. We are actively pursuing grants for the campground and supporting elements.